After years of abuse at home, 19-year-old Dennisse Aldana of Los Angeles was placed into foster care when she was 17. Like many foster kids, she lacked the tools needed for today's digital world. Even the most basic tool in a young student's life -- a laptop computer -- was out of reach. "All throughout high school I didn’t have a laptop, and I felt like I was limited to what I could really accomplish in class," recalls Aldana. To keep up with her fellow students, she typed her essays on her smartphone. Then she emailed them to herself to print out at school. Aldana couldn’t help noticing that her friends all had laptops. "They always just brought their essays right on time. They didn’t have to ask for any extensions. Their essays would be great," Aldana says. "And then I would look at mine. I was never proud of my essays." Now, a partnership of small California nonprofits aims to level the technology playing field for foster kids like Aldana. One of those organizations is volunteer-driven, Los Angeles-based Foster Care Counts. Started in 2012 to serve foster youth and the agencies that support them, it focuses on helping kids get the technical and emotional skills they need to become financially independent. According to board member Winnie Wechsler, laptops are a must-have for these kids. "It is impossible for a teenager today to succeed in college or the workplace without a laptop computer," says Wechsler. Foster Care Counts connects youngsters with the group iFoster, which can secure laptops for these youth at $225 apiece. “We surveyed more than 30,000 caregivers, foster parents, youth and social workers to find out what foster kids need most," says co-founder Serita Cox. "And when it came to concrete goods, access to a computer was the one thing missing." iFoster and Foster Care Counts commissioned a study by Dr. Jeremy Goldbach at the University of Southern California’s School of Social Work. Between 2013 and 2015, he followed the impact laptops had on 730 foster kids ages 16-21 in four California counties. "In academic performance we saw that young people after receiving the laptops reported higher grades, fewer missed days of school and work, and increased pursuit of college and employment," says Goldbach. So far, iFoster says more than 8,000 refurbished laptops have been handed out to foster kids across the country -- about half of them to kids here in California. Dennisse Aldana was one of them. "Well, it just changed my life because I’m actually doing better in college now. 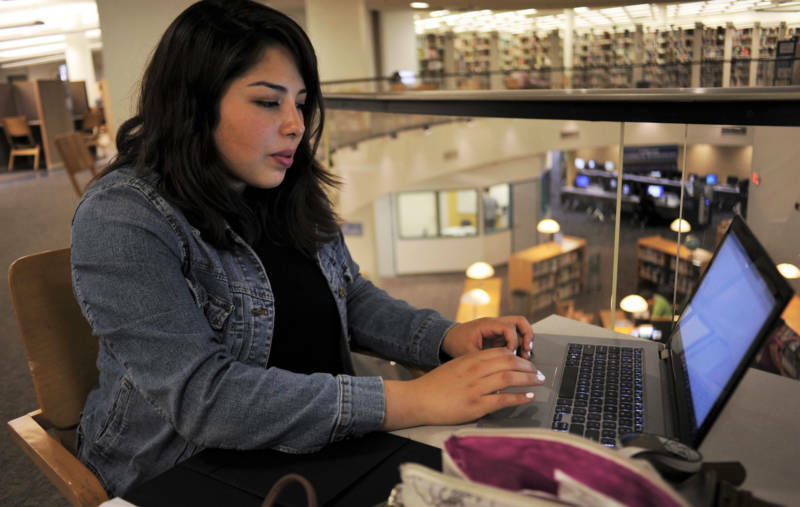 I have a laptop and that’s helping me get through college," she says. She dreams of one day starting a robotics program for foster kids. But first she has some college applications to type out. This time on her own laptop.